Pleasures are a crucial part of our Vienna Boutique Hotel Wilhelmshof – especially culinary pleasures. We prefer local, organic and fair trade produce, but we also support interesting projects such as “Gute Schokolade” by plant-for-the-planet or the extraordinary rum Tres Hombres, shipped by sailing boat without any CO2 emission. This way, you can enjoy high quality without any regrets. Our breakfast buffet perfectly sets you up for the day. We make an effort to serve you a choice of local, organic and fair trade produce. Our artfully designed breakfast rooms are open for you Tuesday-Friday from 6 a.m.-11 a.m., Saturday-Monday (and on public holidays and on long weekends) from 7 a.m.-11 a.m.
Our hotel bar, all designed in warm shades of red and orange, is a popular venue, whenever you want to let an eventful day sink away. 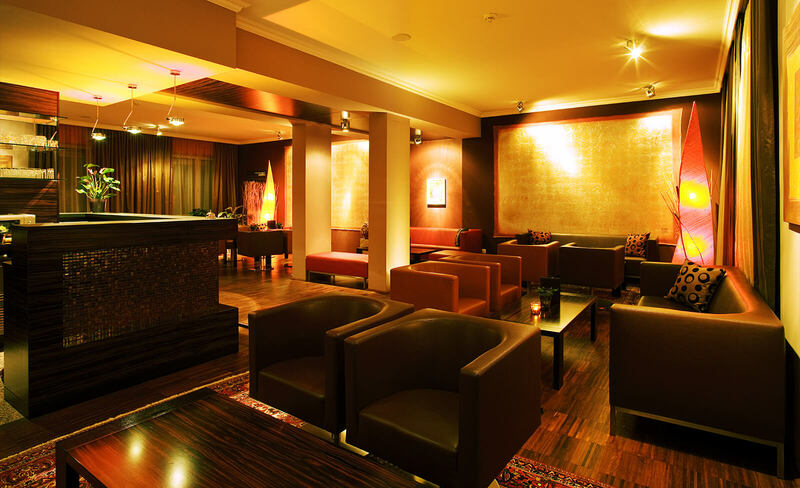 As a matter of fact, art and sophisticated decoration is also part of our bar. Our bar is open for you from 8 a.m.-midnight. Among a high-quality choice of wines, we also serve organic juices, organic and fair trade coffee as well as some snacks. Our gARTen is a green oasis, presenting Ty Waltinger’s art work in terms of so called “processed works under nature’s influence”. In summer 2016, our gARTen received the audience and expert jury award as Vienna’s most beautiful guest garden in the category “versteckte Juwele” (hidden jewels) (Goldener Schani). If the weather is kind, our gARTen is open from 9 a.m.-10 p.m.
You can count on our high quality also when it comes to our minibar. Here, you will find a choice of organic or genuine Viennese products such as organic Cola, Höllinger juices, wines from Viennese vineyards, classic Viennese Manner wafers or the “Gute Schokolade” (good chocolate) by plant-for-the-planet – all this and more at fair prices.